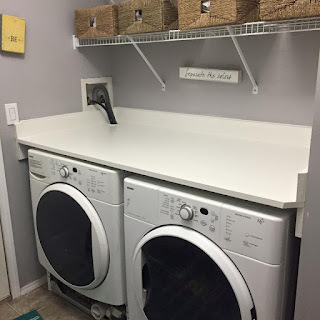 So it's no secret that I hate my laundry - mud room combination. I have spent countless hours wondering how this idea came up and why home builders thought this was a good idea. 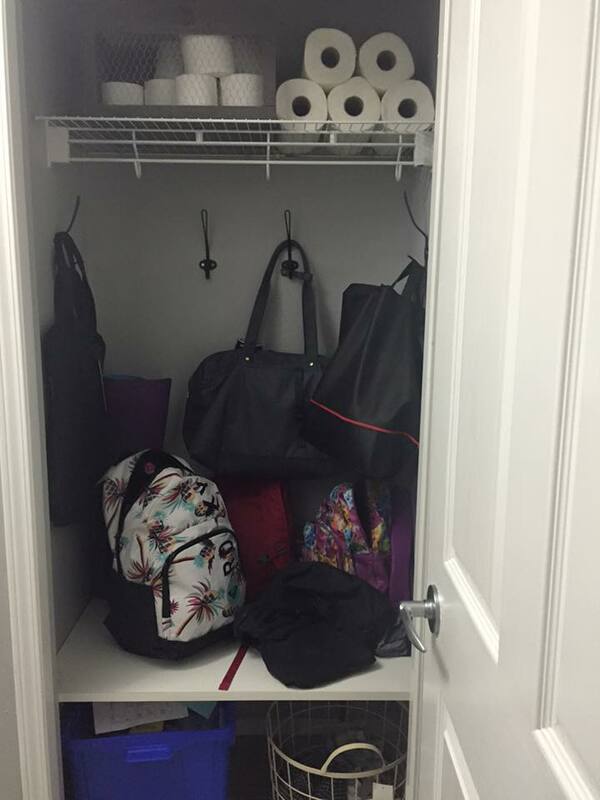 When we bought our house, we were currently living in our townhouse which was on the main floor in a closet so small that contained our furnace, water heater and stackable washer and dryer. You actually had to stand with the door opened to use it. And then when we were done, I had to haul the laundry up to the third floor which SUCKED!! Needless to say, when we were house hunting, this seemed like such a good idea. This room has been painted twice, we have stacked our machines and unstacked them. We had the shelving we see now, then we took that down and stacked the machines and bought this awful awful cabinet that seemed like a good idea at the time. We sold that, unstacked the machines and re-installed the shelves. But I still hated it. We discussed the possibility of moving it to our basement. Our basement was finished and we had a huge storage room that also contained our furnace and stuff as well as our deep freeze and other misc stuff. 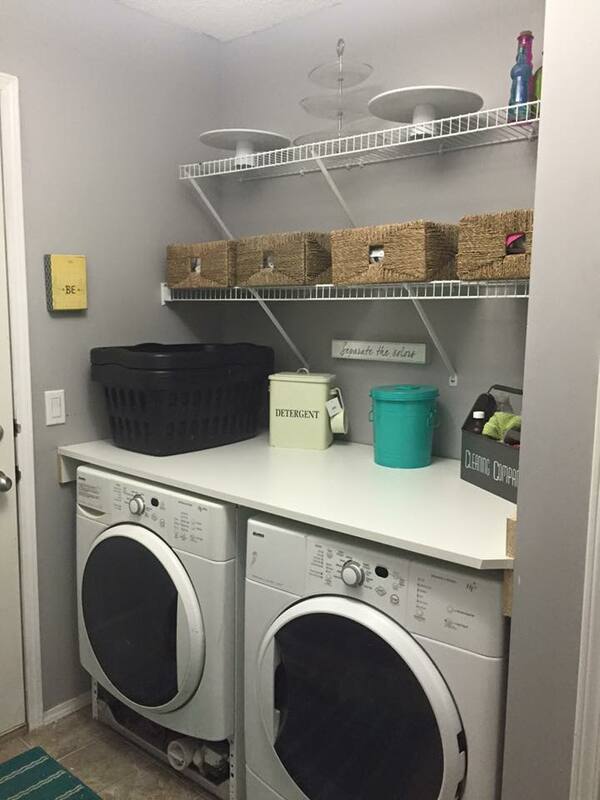 It would have been the perfect space for our washer and dryer. The other option was in the basement bathroom stacked. I thought this was brilliant but the more I thought about it, the more I hated it. I have a hard enough time remembering to take the clothes out of the washer and put them in the dryer when it was conveniently located on the main floor. Basement laundry would have ruined our clothes!! 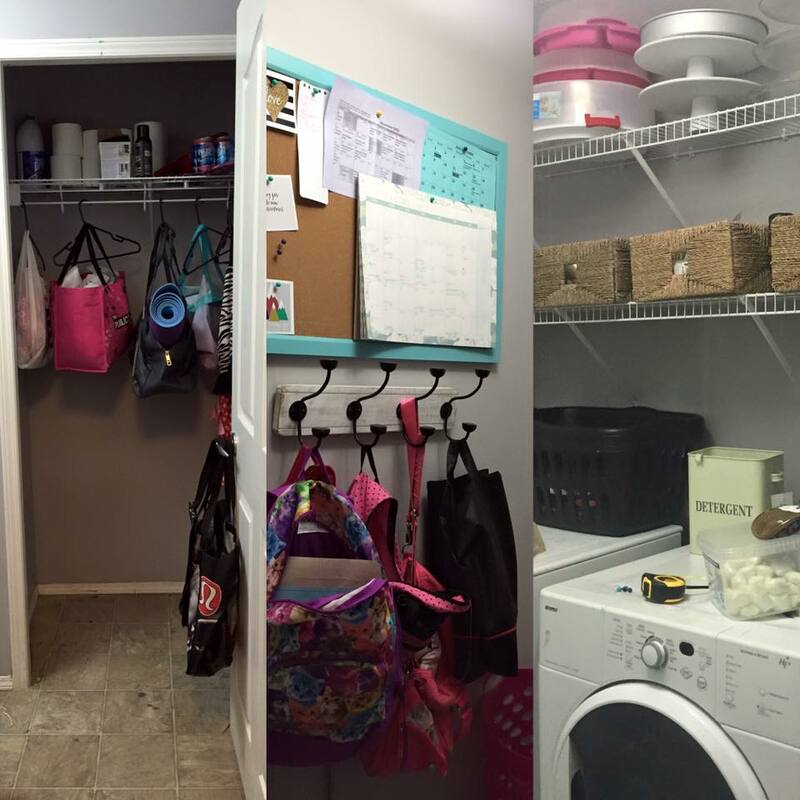 Up until Tuesday of last week, this is a glimpse of what our laundry mud room looked like. The recycling bin and laundry basket are usually in the closet with the bags hanging but I had them removed to sweep when the photos were taken. I texted Greg on Monday if we could stack them again and he asked why. I said I have no idea I just want to make this area more functional and organized and maybe that will help. 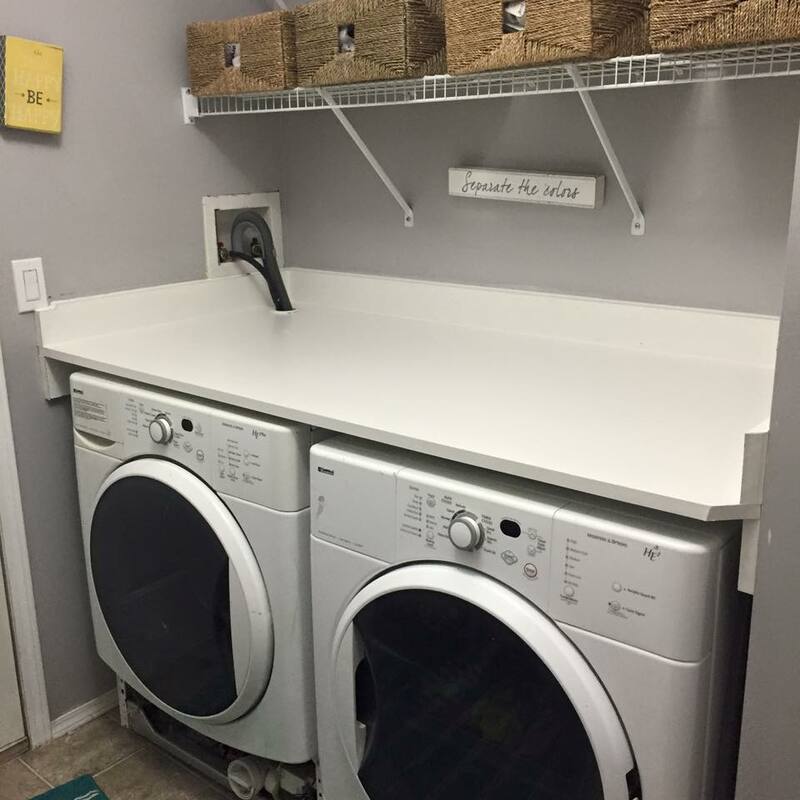 He suggested a counter over top of the washer and dryer. I had wanted that since we unstacked them a few years ago but we never got around to doing it. I wanted more then that. I wanted shelves. Lots of shelves. When Greg got home he were discussing options for the room. I suggested a new house with laundry on the same floor as bedrooms but he was not on board with that hahahaha. He told me that I didn't want all shelves and that I wanted one shelf for the kids to throw their stuff on and hooks for my stuff. I was hoping that by taking the hooks off the wall would open up more space since there would be no bags hanging off of it. Plus the girls - especially Penelope - were terrible for hanging their bags up and usually ended up all over my floor. When I got home from bootcamp that night, he had already drawn out designs for what it would look like, what we needed from Home Depot and the cuts we needed done on the large board of white melamine. I was impressed it was moving so quickly. On Tuesday night after supper, Greg went to Home Depot for all of our supplies and much to my surprise he started it that night. I was excited that he had to cut some of the wood in our garage because there are few smells I love more then freshly cut wood. The most interesting part of this project was how we discovered how not straight the walls were in our laundry room. Now if it were me doing the measuring and cutting you could say this was all on me but this is where Greg excels and is very good at measuring and cuts since this is what he does a lot at work so it was definitely the walls. 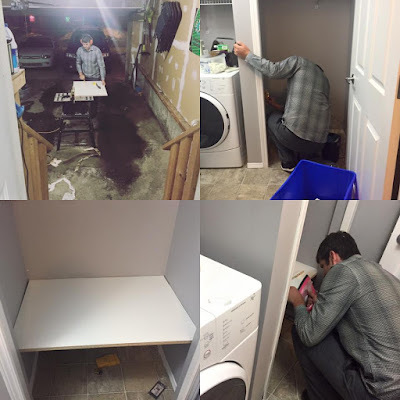 He finished this part of the laundry mud room combination in one night! I was so happy, surprised and impressed. I set out not wanting hooks but I think he is right in that a few hooks work and then the shelf for the kids stuff. This should mean that nothing is on the floor ever!! The hooks I found at IKEA and I had no idea that they had such nice ones. I would have preferred them in white but all the white ones looked like they belonged in basement storage rooms. It was my friend who brought these hooks to my attention and also the reason I wanted to make my laundry mud room more functional since they just did a big makeover to their mudroom. I wanted the shelf where it was because it looked good and I have a bad habit of letting my recycling bin get very very very high so this will also put an end to that. On Wednesday and Thursday Greg worked on the counter for over the washing machine forever crushing his dreams of having a top loading washing machine again. Again we noticed that the wall wasn't straight and we had some gaps because of it. He was going to add some trim to make it look better but Greg has this habit where he gets the big part done and then the little details kinda never get done. Case in point - the wood trim that needs to go between the fireplace tile and the hardwood has never been installed and its been over 5 years!! So I thought that it would not get finished for a long time so I decorated it. Then he came home and was like don't take photos it's not done yet, I will finish it tomorrow. I was like ok whatever and went about my evening. 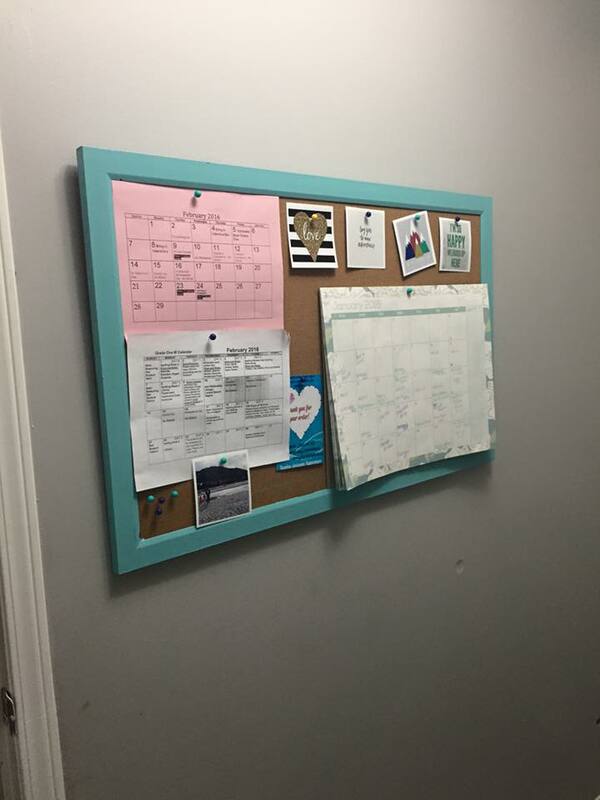 No more hooks - just a cork board with the kids school calendars and a regular calendar for keeping us all organized with work, running, races, trips, soccer etc etc etc. It was a black boring frame and I painted it teal to make it pretty. It works really well in the space. And best of all no bulging book bags and soccer bags. Sure enough on Saturday Greg did finish 100%, he even put the white bottom piece back on the washer which had been off since it broke a few years ago. See what I mean that I was surprised when he wanted to finish the project up completely?? It's really rare that this happens!! I am really happy with how this turned out even if it was not what I had envisioned when I suggested the idea to Greg. As much as it pains me to admit it, he was right with the hooks and shelf. I am also very grateful to Greg for putting in so much work this week after work to get it done for me. Hopefully this stays clean and organized going forward. If not, I will have to work hard on getting me a new house hahaha. Everything else was either already in the laundry room or re-purposed from other areas of my house!